Sony has been busy with a lot of re-imagining within its smartphone lineup lately. With the "Z" series now officially in the history books and the introduction of the new "X" moniker in its place, with devices like the Xperia X and X Performance, as well as another new Xperia XA lineup, hearing about new and mysterious Sony devices is hardly an isolated occurrence. However, that doesn't make these discoveries any less exciting and the same goes for the Sony 24UJ95LH34QX77B1, recently spotted in the GFXBench database. The model bears quite a lot of similarity to the Xperia X Performance. It uses the Qualcomm Snapdragon 820 and also has 3GB of RAM, making it a close sibling to the current Sony flagship. Its display also has a resolution of 1920 x 1080 pixels, but, oddly enough, its size is listed as 5.1-inches, instead of the 5.0-inches on the X Performance. 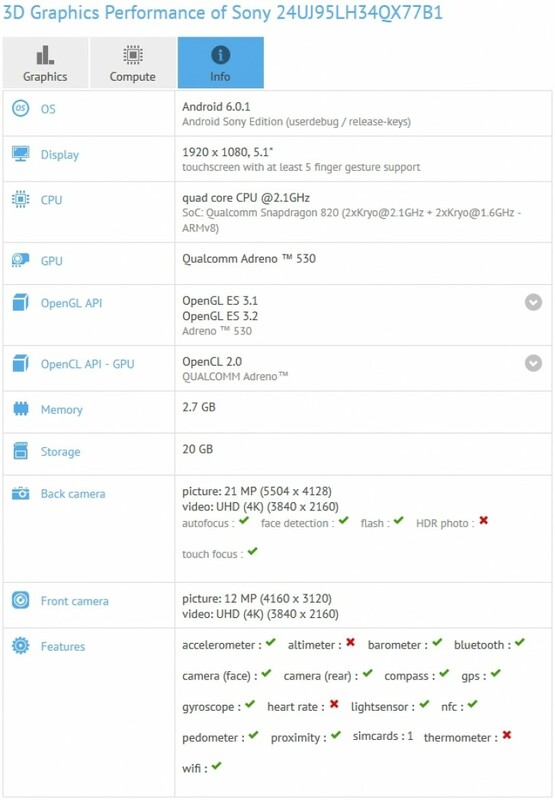 Bear in mind that GFXBench specs reading are taken from the handset's internal variables and are therefore prone to some errors, which might account for the small 0.1-inch difference. However, there are a few other more distinct differences between the two devices as well. For example, the camera setup on the unidentified handset consists of a 21MP main shooter and a 12MP selfie one, in place of the 23MP, plus 13MP combo on the Xperia X Performance. All things considered, we might be looking at an entirely new device, however, there is also the distinct possibility that this is a small modification on the Xperia X Performance that is yet to enter the lineup or perhaps even a regional modification. We would love to hear your take in the comments. The black and petroleum blue is gorgeous how can you say it is ugly? Please show your real account, we are here to giving quality opinion not trolling.